It may seem trivial to care about whats happening in Hollywood and how movie schedules have changed in light of the barbaric acts of Sept. 11. Nonetheless, the movie industry is a big part of our economy and it does provide people with joy, escapism and even intellectual stimulus. Movies are something to do. Movies are something normal and routine. Movies are something to look forward to, especially for film lovers (like me). Within hours, maybe minutes, of the World Trade Center twin towers collapsing, film studios were rethinking how movies should be made, marketed and released. Margaret Stratton, a former theater manager and current studio public relations representative in Houston understands why the Touchstone Pictures release of Big Trouble was pushed from last Friday until sometime in 2002. The Barry Sonnenfeld (Men in Black, Get Shorty) comedy starring Rene Russo and Tim Allen involves a neutron bomb and a handgun getting by airport security. Touchstone has another movie in limbo. The Christmas release of the Chris Tucker, Anthony Hopkins Bad Company has been pushed way back because New York City is targeted with a nuclear bomb. Jeffey Wells, at Reel.com, said theres a line  delivered by a terrorist  about turning Wall Street into a piece of charcoal. Some theater owners, not the distributor, decided Megiddo: The Omega Code 2 should be pulled from release. The low budget, apocalyptic Christian-themed film starring Michael York and Michael Biehn did still open at many theaters countrywide on Friday. On the other side of the budget spectrum, the estimated $90 million Arnold Schwarzenegger film Collateral Damage  was slated to open Oct. 5, but has been pushed back indefinitely because terrorists bomb a tall building in Los Angeles. 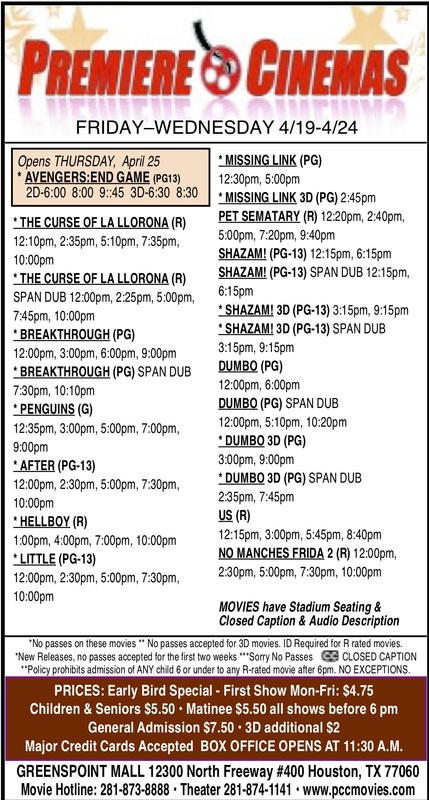 The Oct. 21 release of Dreamworks The Last Castle has not changed, but its ads have. 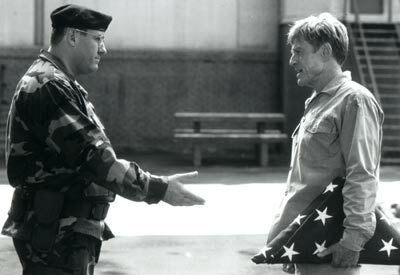 The commercials showed an American flag flying upside-down, a symbol of distress. Spider-Man trailers have been removed from theaters because of a scene with a giant spider web strung between the World Trade Center towers. Shot just for the ad, it was never to be shown in the movie, which is scheduled to open in May. Denzel Washingtons latest, Training Days, was supposed to open last Friday, but was pushed to this Friday because of Warner Bros. thought promoting the film would be too difficult in the days following the attack. Men in Black 2 is still supposed to be released on July 3, but the ending will be different. The original climax involved the World Trade Center. Only history will be able to accurately reflect on exactly how the attack and its aftermath have effected us internationally, nationally, locally and personally. No doubt, a movie will be made in the future telling us how to think about this time in history. On September 14th, Beulah Johnson Elementary was visited by 0l Blue a 1951 vintage 80,000 lb. working-truck. Founded in 1986 0l Blue, USA is a nonprofit charity dedicated to educating the nation on highway safety. Johnsons students watched attentively as driver R.J. Taylor demonstrated that due to the size and weight of large vehicles abrupt stops and lane changes are not possible. Students also learned the location of the blind spots on such a large vehicle. 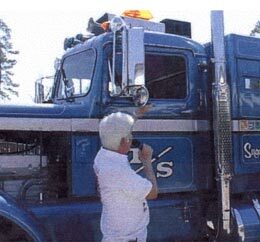 Students returned home to educate their parents and others about safety around large vehicles. (L-R) Bopha Chea, Nikayla Vigil, Mark Serna, and Ryan Wooten along with their teacher, Stacey Hoyle, display some of their efforts for Red Cross fundraising. Fourth graders made and sold red, white and blue lapel pins and magnets at the recent open house held at Stephens Elementary. These sales raised $250 for the Red Cross funds. Cash donations brought the 3-day total to $1,530. The large flag seen in the background was constructed by Susan Larson and her students. Concern for others is seen at Stephens Elementary where 4th graders have been busy raising funds for the American Red Cross relief funds. Fourth grade teachers Stacey Hoyle, Susan Larson, Jenifer Skivington, Jenny Barrett, Vicky Roberts, Jodi Schmiess, and Pattie Simpson along with student teacher Susan Hwang Po have spearheaded a school-wide fundraising effort for the Red Cross relief funds. Interested in doing something positive to aid people who were victims of the September 11 attack in New York and Washington, D.C., Hoyles students wanted to create patriotic pins and magnets to sell during recent open house activities. Enthusiasm spread throughout all of the fourth grade classes with students using their creative efforts in a very positive manner. Sales of the pins and magnets netted $250. Along with this project, students also began a campaign to encourage every class at Stephens to donate money for the Red Cross programs. The total for just 3 days of donations is over $780 – that is a lot of pennies, nickels, dimes, and quarters! The Stephens PTO also gave $500 for school-wide a total of $1,530. Contributions will be collected for the next two weeks at Stephens. 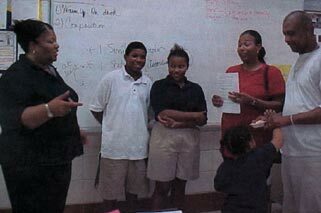 Word of the students project has spread to business partner, Hartford Insurance Company. 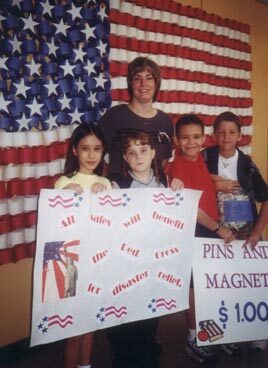 The employees at Hartford want to help the students by purchasing the handmade red, white and blue pins and magnets. Third grade classes taught by Christi Chandler, Judy Johnson, DeaVanca Simon, Jan Jeanlouis, Nikki Hudson, and Jennifer Morrison will join the fourth graders in producing more pins and magnets to be sold. Everyone at Stephens has done a tremendous job in making the Red Cross fundraising such a success, Hoyle said. We are proud of our students and their concern for others. Language Arts teacher S. Boyd talks with students and parents about expectations and achievements at this years Hambrick Middle School open house night. More than one thousand students are attending the Exemplary rated campus this year. 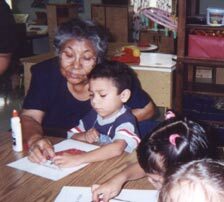 Friday, September 7, was Grandparents Day at Hinojosa ECIPK Center. Grandparents were invited to their grandchilds classroom where they were served refreshments and participated in an activity. With shirts pressed, buckles shined and shoes polished, Students involved in the Hambrick Leadership Officers Training Corps (LOTC) undergo inspection for the first time this year. 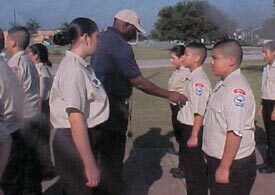 Pictured above, Sergeant Weaver takes a closer look at his cadets. Hambrick Middle Schools LOTC has been a consistent top performer during competitions over the last several years. It had been billed as a blackfin tuna trip. On a previous outing during the same time of year aboard the Freespool, our group had located the blackfin under ocean-going shrimpers only 35 miles or so off the coast of Port Aransas. A few scoops of chum thrown overboard near the stern of one of the anchored shrimp boats brought swarms of speeding blue-black shapes boiling the blue-black waters around our boat. On that first trip, all of our big chests were overflowing by 11:45 am, and we left the tuna swarming in the waters. This years trip was different! Our small contingent of outdoor writers met Captain Jeff Heinmann (361-749-7154), the skipper of the Freespool, on the dock long before dawn. The Freespool is a wide beamed 42 Hatteras with a customized configuration designed especially for offshore sport fishing. Captain Jeff is a trained marine biologist and has been a knowledgeable offshore captain for 15 years. We had been informed that the big schools of migrating blackfin tuna had not moved into the Gulf yet. They are usually feeding around the rigs and anchored shrimp boats by this time of year, but I guess nobody told the tuna. We rumbled out of the Port Aransas Harbor and into the darkness of the Gulf. Dawn found us plying miles of rolling seas as the sunrise painted a purple and pink masterpiece in the sky contrasting with the sparkling blue-black and turquoise waters of the Gulf. After about a three-hour boat ride and 50-plus miles into the Gulf, we sidled up to a towering offshore rig. Everyone lowered lines into the deep, clear waters near the rig. We had almost immediate hook-ups on some keeper-size red snapper. Quickly, we started hooking into sow snapper about 200 deep. Most of these were in the 16-20 pound range. During the fast-paced fishing, I hooked something that I could tell from its speed and strong runs was not a snapper. After I fought it to the surface, it turned out to be the first of several hard-fighting amberjack that we caught that day. Suddenly, a rod sounded. It belonged to Barry St. Clair. He set the hook on a strong fish, and line streamed off his reel. There were some tense moments when Nate planted the gaff and lifted the ling. The big fish tore loose in mid-air and plummeted headfirst back into the water. Barry hung onto his rod for dear life. On the second pass, Nate again gaffed the fish. This time the gaff held. The big ling crashed onto the deck. Clearing the deck with his thrashing tail, the ling was finally wrestled into the fish box. I gave Barry a few high fives and congratulated him on such a fine fish. We went back to fishing. A persistent problem we had encountered was schools of big barracuda. 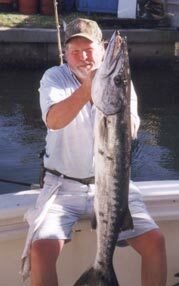 The barracuda like to roam the deeper waters of the Gulf and are vicious predators. We had a lot of nice fish bitten off the hook, bitten in half, or brought to the surface looking like they had been run through a paper shredder. Lets try another spot, said Captain Jeff. We motored a few miles farther offshore and moored up to one of a cluster of big rigs. We were able to get a measure of revenge against the barracudas after we rigged up with wire leaders. Several of the big, toothy critters were introduced to our ice chests. I lifted the rod tip high as I set the hook. Line was still screaming off the reel at a blistering pace as the fish headed for the next rig. I knew if the fish got my line against one of the barnacle ecrusted legs of the rig, the fight would be over. I put more pressure on the big fish and finally got his head turned into open water. Look at the teeth on that monster, someone yelled. Yeah, I think I used to date one of her sisters, someone else joked. Inspecting the fish in the chest, I steered clear of the strong tail on one end and the mouth full of razor sharp teen on the other. The fish were still feeding, but soon everyone had limited on fish. We pulled in our lines and got ready for the almost 60 mile trip back to the Port Aransas Harbor. We had spent a banner day in the Gulf. We never did locate the blackfin tuna, but we found plenty other gamefish to keep us busy and fill our ice chests. This is the week Aldine ISDs four varsity head coaches have been pointing towards since practices began on Aug. 13, the start of the District 21-5A season. AISD and Spring Branch schools will begin contending for the leagues three playoff spots this weekend, and from the looks of things, it should be a competitive district race. If its first two games are any indication, Eisenhower (the Eagles third game was played after this column was printed) appears to be the class of league, but there are a handful of other clubs out there that will give Richard Carsons team a run for their money during 21-5A play. Before we take a look at the first week of 21-5A play, lets review last weeks abbreviated results. Due to the terrorist attacks in New York and Washington, there were no games played in the NFL or in the NCAA. I went 2-2 in the four high school games that were played to bring the early-season record to 10-6 (62 percent). Now lets take a look at the first week of District 21-5A play. Now lets take a look at the NCAA schedule, where a number of key match-ups are on tap. Now lets take a look at the NFL, where the defending Super Bowl champs get their first real test of the season. New Orleans at NY Giants: The Saints seem to have all the pieces in place to make a serious run at the Super Bowl this year, which will be played in the Superdome (how convenient!). Another win on the road against a quality opponent will force a lot of teams to take notice that last years season was no fluke. Quarterback Aaron Brooks looks comfortable now that hes been named the starter and tailback Ricky Williams adds another dimension to the team with his ability to catch passes out of the backfield. But dont expect the Giants to go quietly. They still have plenty of weapons and one of the leagues best defenses. Look for Kerry Collins to use the pass to set up the run in this one as the Giants get by the Saints. Another thing to keep in mind (perhaps the most important), this will be the Giants first home game since the World Trade Center was attacked on Sept. 11. The Giants and their fans will definitely be emotional. My pick, New York Giants 26, New Orleans 21. San Francisco at New York Jets: Yes, the Giants play at home on Sunday and the Jets on Monday night. As was mentioned above, emotion will play a huge role in this game. The Jets want to help continue the heeling process in the city, and what a better way to do that than to pick up a win in front of the entire nation on Monday night. This should be an entertaining game to watch at SF quarterback Jeff Garcia and his stable of talented receivers will try to play pitch and catch against a suspect New York defense. On the other hand, look for the Jets to try and control the clock with running back Curtis Martin. Its going to be tough to pick against either New York team this weekend, so I wont. My pick, New York Jets 31, San Francisco 27. Q: What is New Hire Reporting? Is it useful in collecting child support from hard-to-find deadbeat parents? A: New Hire Reporting is a program mandated by federal law that requires employers to report new employees within 20 days of their hire date. This program went into effect October 1, 1998. The reporting time frame applies to employers who report their new hires manually. Employers who report electronically need to report any new hires at least twice a month – 12 to 16 days apart. Information received from employers is entered into a statewide registry and then transmitted to the National Directory of New Hires. Entries on the state and national registries are compared to databases of federally approved state agencies, including this offices Child Support Division. The information contained in the directories is used by the Child Support Division to locate parents who have not paid their child support obligation. When a match is made, a wage withholding order is sent directly to the non-custodial parents employer so that child support payments can be withheld from the parents income automatically. Every night, approximately 1,000 wage-withholding orders are sent to employers throughout Texas and across the country. I want to thank all employers who are currently complying with federal and state new hire reporting requirements. Your efforts make it possible to collect more money for Texas children. In State Fiscal Year (SFY) 2000, 270,303 automated orders were sent to employers, which resulted in $156 million in child support collections-15 percent of the total child support collections in SFY 2000. Call 1-888-839-4473 to set up an FTP account before using this reporting method. Q: Who can apply for the child support services offered through the Office of the Attorney General and what is the fee? A: The Office of the Attorney General accepts applications from mothers and fathers. There is no fee to apply for child support services provided by the Office of the Attorney General. Our attorneys represent the State of Texas in providing child support services and do not represent either parent in the case. Temporary Assistance to Needy Family (TANF) recipients and Medicaid Only recipients automatically receive child support services, but persons who do not receive TANF must apply for Title IV-D child support services. For information on services offered by the Child Support Division, call 1-800-252-8014, or visit the Office of the Attorney General Web site at www.oag.state.tx.us. In the case of unsolicited faxes, you can also file a complaint with the Federal Communications Com-mission. You can get more information through their Website at www.ftc.gov. The Houston Police Departments Northline Park Storefront has organized a steering committee to form the Northside/Northline Hispanic Positive Interaction Program (Hispanic PIP). Community leaders and HPD Northline Park Storefront gear up for the first monthly meeting set for Thursday, October 4, 7:00 P.M. at 10020 Bauman. The meetings will be conducted in Spanish in an effort to reach non-English speaking Hispanics. English translation will be available. The HPD Northline Park Storefront strives to identify and solve safety and quality of life issues that affect several northside communities through a coordinated effort between the community and HPD. Hispanic leaders and HPD personnel have been meeting to plan and organize The Northside/Northline Hispanic Positive Interaction Program. Stakeholders attending the meeting included representatives from non-profits, churches, schools, and businesses. The goal is to encourage residents to work together to identify, prioritize and address the needs and concerns of the community by providing a Spanish speaking forum. Furthermore, this Hispanic PIP will assist in creating a manageable framework for community action which will allow the city to provide services more efficiently. The Northside/Northline Hispanic Interactive Program is another avenue for city government to become more responsive to concerns of Houston residents. The Northline Park Storefront and the city will work with the Hispanics to address problems, ensure prompt, courteous and efficient delivery of city services and focus attention on neighborhood priorities for public infrastructure and other needed improvements. Once the Hispanic PIP is created, the Northline Park Storefront will work with the community and hold meetings every first Thursday of the month to discuss concerns and find solutions. Additionally, the goal of the meetings is to form a strong link between the residents and city government by communicating directly with key personnel in various city departments regarding the delivery of city services and other issues affecting the neighborhood as a whole. The Hispanic PIP will serve as a forum where residents, businesses, schools, and churches can discuss Issues impacting their neighborhood and ultimately reach a consensus on high priority projects to improve the overall community.